Now is the time to plan ahead for your business ready for 2019 to make sure you don’t miss out on any sales opportunities! This week we cover the hottest and most in-demand treatments tipped for success in 2019 to help you decide if there are gaps within your business plan that need addressing with a new course or just by bringing this back into focus with your clients during your mid-appointment discussions with clients. And then don’t forget planning your offers for 2019 which you should be starting to plan for now before the pre-Christmas rush takes over! Gel Polish – more clients than ever have now converted to the benefits of gel polish treatments over traditional manicures and nail extensions. The advantage of gel polish is that you can fit in more clients and earn more than offering nail extensions. Learn more of the benefits of offering gel treatments here. Gel polish is a great treatment to learn to quickly start earning – it can be studied online or with our 1 day training course. Facial Skincare – with more male clients seeking treatments to improve the appearance and condition of their skin, skincare treatments have grown hugely in popularity. Skin rejuvenation is at the forefront of what many clients now seek but with more people moving away from dramatic chemical peels or dermal filler treatments, Microdermabrasion is now one of the most popular treatments in the salon and for home based therapists. Last but by no means least, Holistic Therapy is now a huge sector of the beauty industry with spa treatments more accessible than ever. Many people (who may not otherwise have other beauty treatments) are enjoying the benefits of booking for a fortnightly or monthly massage. Swedish Body Massage are great skills to have but treatments such as Indian Head Massage are only set to grow with more employers hiring in freelance therapists for oil free, over clothes massage treatments for their employees based in the office or with massages now being a regular sight at gigs and events. 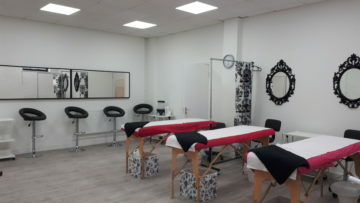 Train with The Beauty Academy in 2019 at one of our 10 beautifully presented, permanent and exclusive training centre locations including our brand new Harlow & Clapham Junction centres. Alternatively discover our huge range of Online beauty training courses, all delivered from our incredible online student portal platform giving you the flexibility to learn anywhere, anytime at your own pace but with full support from our in-house team of experts.